The Soutestern Islands include Guadalupe, Isles Des Saintes, Dominica, Martinique, St Lucia, St Vincent and the Tobago Cays, Grenada and the further south all the way down to Trinidad & Tobago. We arrived in Guadalupe after leaving Montserrat. The highlight of this leg was the big catch and the excellent weather as we sailed into Deshaies at the North West tip of the big island of Guadalupe. 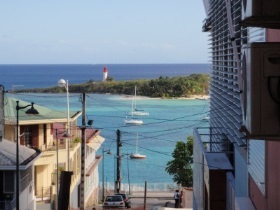 Guadalupe is the largest island of the eastern Caribbean and is also a French territory. The island is split in two by the Rivier Salee, to the west is Bas Terre which is actually very mountainous and to the east of the river is Grande Terre which is relatively flat and where most of the agriculture is produced. The west or Bas Terre is very scenic with rain forests and the coast is well known for great diving. 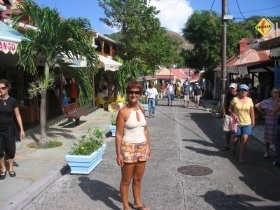 We stopped at the Pigeon Island Park for one night and then headed down and east to Isle De Saintes, this group of islands are also part of Guadalupe. We spent a couple of weeks here and hiked the whole island of Terre De Haut from one end to the other and tasted all the pastries that this island is famous for. The dingy was running very low on fuel and would need it filled before we headed further south, but there is only one gas station on the island and to get to it was either by dingy to windward (very wet and dangerous) or hike with a 3 gallon fuel tank strapped to the two wheel cart. We chose the latter, crossed over to the other side on paved roads and then hiked the rest of the way to the entrance of Marigot bay. Filled up and a fisherman that was just about to leave gave us a very wet ride to the beach where we could carry onto paved roads saving us the hike portion. During our stay in The Saints we saw the large Maltese Falcon that anchored behind us, the captain called us and sent one of his crew with a couple of Maltese Falcon caps. On Jan 20th 2008 we picked up anchor and headed down towards spectacular Dominica, we dropped anchor at the northeast end of Portsmouth. From here we would explore the island visiting the capital Roseau and the southern tip at Scotts Head. A few days later we headed down the coast and decided to pick up a mooring from Poncho, a local fellow who has about six mooring in front of his beachfront house, cost per night was $10 US. The water is too deep here to anchor and is more convenient to just pick up the mooring. From here we took a bus to the town of Soufriere and from there we hike up 1600ft to the other side of the ridge to the town of Tete Morne, the scenery on both sides was spectacular, on the way up we came across sulphur springs, rivers and a 12” path that snaked up towards the ridge, just incredible. We had great facilities at the Anchorage Hotel, they let us use there dock to land the dingy and free WiFi. The people in Dominica must be the friendliest on earth. 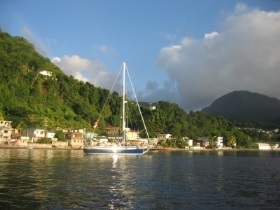 After a couple of days in Roseau we let go of the mooring and headed down towards The Windward Islands.